Trees bring a multitude of benefits to cities, helping the environment as well as residents’ quality of life. Photo by Tristan Higbee/Flickr. Trees often fade into the background of what people understand as the city, yet they bring immense value – including environmental benefits like filtering water run-off and cleaning the air as well as increasing health and quality of life – that their role in creating vibrant urban environments should be understood and celebrated. Creating sustainable cities for the future means understanding the intersection of infrastructure and green space necessary for livability. Urban trees contribute to the kinds of vibrant spaces that people want to inhabit and the kinds of cities that residents can’t help but feel connected to. Trees help to clean numerous different ecosystems, both within and outside of the city. They help manage urban storm water, simultaneously helping to decontaminate this water and prevent erosion. It is estimated that urban forests can reduce annual runoff by 2 – 7 percent in cities, which means fewer flooded roads and polluted rivers. Also, proximity to parks and green spaces has real economic value, increasing small business traffic and boosting property values. Moreover, trees have an impact on people, from their physical health to the more subtle components of well-being like stress levels and happiness. Trees directly aid public health by taking contaminants out of the air that can get trapped in people’s lungs, causing everything from cardiovascular disease to cancer. A recent study showed that the tree canopy of New York City – through its ability to filter particulate matter – saves eight lives per year. Yet the benefits of trees are probably most visible to citizens by their impact on livability. Jeff Speck, an expert on creating walkable cities lists planting trees as one of ten key techniques cities should pursue to increase walkability. Others have shown that trees can calm traffic and help protect pedestrians. In many cities in the United States, trees were neglected during the post-World War II suburban boom. A notable example is Washington D.C., where disease and disinvestment caused the city’s tree canopy, once encompassing 50% of the city, to shrink considerably. Today the district’s Urban Forestry Administration, along with groups such as Casey Trees, are working towards bringing back a 40% tree canopy coverage of the city. Projects such as the urban forestry and green infrastructure enhancements have helped D.C.’s canopy grow to 36% through private planting and street tree maintenance. Meanwhile, in New York City, a private public partnership between the city and the New York Restoration Project is helping to plant one million trees in the city, which already has over 5.2 million trees – roughly one for every two New Yorkers. However, in rapidly developing economies where city budgets can be tight and urban growth is immense, the case for why trees should be an integral component of urban development must still be made. Parts of Mexico City have beautiful trees along their streets, while poorer neighborhoods on the eastern side of the city are often barren. This urban deforestation trend leaves many citizens without a connection to nature and threatens the replenishing rates of the “Water Forest” that supplies the city’s water. 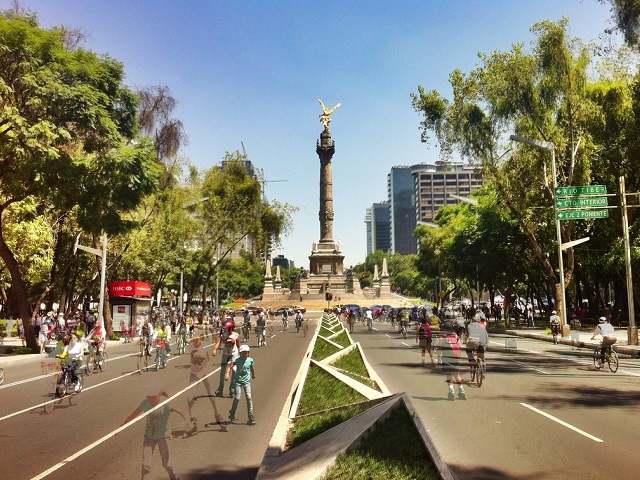 These challenges are not unique to Mexico City, but are present throughout many rapidly urbanizing countries, from India to China to Colombia. Now more than ever rapidly developing cities must recognize the importance of trees and engrain urban tree canopies into their development plans. The good news is, the Food and Agriculture Organization (FAO) is developing urban forestry guidelines that can help cities do just that. Through these efforts and more attention from policymakers, we can use trees as important development tools that bring multiple environmental, health, and social benefits that make the world’s cities better places to live. Tags: air quality, Ben Welle, deforestation, erosion, Food and Agriculture Organization, green space, North America, public health, Quality of Life, road safety, United States, urban tree canopy, Washington, D.C.